Thomas Dunne Books, 9780312642358, 339pp. 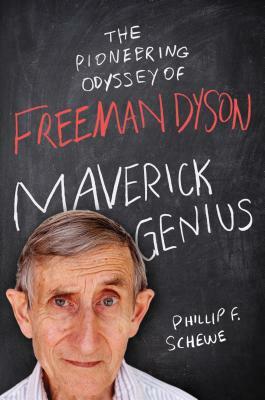 For decades, Freeman Dyson has been regarded as one of the world's most important thinkers. "The Atlantic "wrote, "In the range of his genius, Freeman Dyson is heir to Einstein a visionary who has reshaped thinking in fields from math to astrophysics to medicine, and who has conceived nuclear-propelled spaceships designed to transport human colonists to distance planets." Salon.com says that, "what sets Dyson apart among an elite group of scientists is the conscience and compassion he brings to his work." Now, in this first complete biography of Dyson, author Phillip F. Schewe examines the life of a man whose accomplishments have shaped our world in many ways. From quantum physics to national defense, from space to biotechnology, Dyson's work has cemented his position as a man whose influence goes far beyond the field of theoretical physics. It even won him the million dollar Templeton prize for his writing about science and religion. Recently, Dyson has made headlines for his controversial views on global warming, and he continues to make waves in the science community to this day. A colleague of Albert Einstein at Princeton and friends with leading thinkers including Robert Oppenheimer, George F. Kennan, and Richard Feynman, Freeman Dyson is a larger-than-life figure. Many of his colleagues, including Nobelists Steven Weinberg and Frank Wilczek, as well as his wives and his children, Esther and George Dyson, have been interviewed for this book. "Maverick Genius, "Schewe's definitive biography, paints a compelling and vibrant portrait of a man who has been both praised for his genius and criticized for his unorthodox views. PHILLIP F. SCHEWE works at the Joint Quantum Institute at the University of Maryland, where he is director of communication. He has a PhD in physics but has spent most of his career as a writer, chiefly as an explainer and popularizer of science. In addition, he has written numerous plays, which have been performed in New York, Washington, DC, and elsewhere. His previous book, "The Grid," a history of the impact of electricity on society, was called by NPR one of the top science books of the year for 2007. He lives in Takoma Park, Maryland. "A compelling biography of a true renaissance man: Freeman Dyson, an iconoclastic scientist who writes like a poet and has stirred controversy over his views on climate change. By masterfully intertwining the multiple threads of Dyson’s life, this book has become a tapestry that illustrates the complexity of a passionate genius who cares deeply about the fate of humanity and has made major contributions to quantum physics, advanced mathematics, nuclear arms control, national security, and the reconciliation between science and religion." "A fascinating account of an iconoclastic scientific polymath and the lively collection of scientists who were his friends." "A lively…excellent introduction to the history of the U.S. electricity system for general readers."